What a great day yesterday (8 October 2018) – the Victorian Community History Awards were held at the Pavilion, the Arts Centre, Melbourne. Jennifer Bantow (pictured) and Ros Lewis won the Judges’ Special Prize for their magnificent publication Barro-abil. Our Beautiful Barrabool Stone. History and Use of Barrabool Sandstone. This was the second last award of the day and resulted in great excitement – it came after all the category Commendations and Winners had been announced with the remaining entrants believing that they had missed out on both an Award and a Commendation. There were 99 entries that weren’t announced during the event which makes receiving a Commendation very special – there were only 30 in total from the various categories. Winning an award was even more special – only 11 of those for the day. Congratulations to Jennifer and Ros – it’s a magnificent publication and the Judges’ Special Prize was well deserved. In 2013 Rod Charles won the Judges’ Special Prize for his publication A Whirr of Many Wheels. I hope I am bringing good luck to our locals when I sit beside them at these awards! 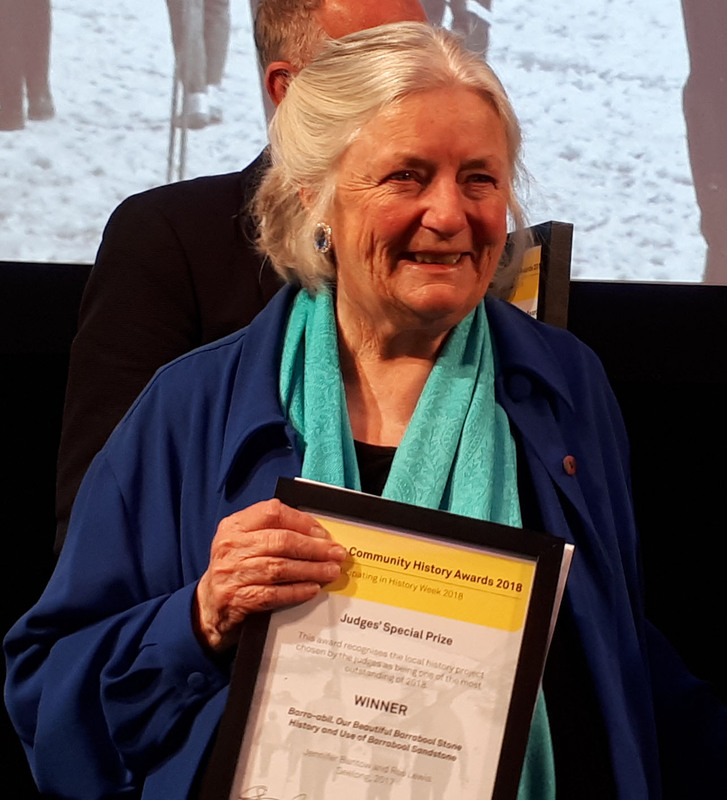 Historical Interpretation Award – Commendation to Cheryl Baulch and Chris Barr from Torquay Museum Without Walls for their wonderful and innovative Torquay History App – definitely worth downloading. The Local History – Small Publication Award – Commendation to Jill Wheeler and Del Atkinson from the Linton and District Historical Society for Linton. A Photographic History. This is a beautiful publication full of wonderful images with extensive history captions. Perhaps the most special event of the day was the comprehensive and moving tribute to Dr Joan Elizabeth Hunt by Associate Professor Don Garden, President of the Royal Historical Society Victoria. Joan was one of the judges of the Victorian Community History Awards and was working on it the day she had her fatal stroke. Gary and Trevor Hunt, Joan’s husband and son, were at the awards yesterday and they really appreciated the wonderful words covering Joan’s enormous contribution to local and family history in Victoria. And it would be very remiss of me not to mention the ‘keynote speaker’. If you ever get the opportunity to listen to Jessie Lloyd either speak or sing, don’t miss the chance. Her music was beautiful but her words and message were absolutely worth hearing. Learn more about her Mission Songs Project. A great day – the 20th anniversary of these awards – well done to the Royal Historical Society Victoria and the Public Record Office Victoria.